رضانژاد, شقایق, نظرنژاد, نورالدین. (1392). تولید نانوسلولز از پوست دانه برنج. مجله صنایع چوب و کاغذ ایران, 4(2), 153-163. شقایق رضانژاد; نورالدین نظرنژاد. "تولید نانوسلولز از پوست دانه برنج". مجله صنایع چوب و کاغذ ایران, 4, 2, 1392, 153-163. رضانژاد, شقایق, نظرنژاد, نورالدین. (1392). 'تولید نانوسلولز از پوست دانه برنج', مجله صنایع چوب و کاغذ ایران, 4(2), pp. 153-163. رضانژاد, شقایق, نظرنژاد, نورالدین. تولید نانوسلولز از پوست دانه برنج. مجله صنایع چوب و کاغذ ایران, 1392; 4(2): 153-163. Hubbe,M.A., Rojas,O.J., Lucia,L., and Sain, M., 2008. Cellulosic nanocomposites: A review, Bioresources 3(3): 929-980. Ioelovich, M., 2008. Cellulose as a nanostructure polymer: A short review, Bioresources 3(4):1403-1418. Gardner, D.J., Oporto, G.S., Mills, R., and Azizi, A., 2008. Adhesion and surface issues in cellulose and nanocellulose, Journal of adhesion science and technology 22:545-567. Reitzer, R., 2007. Technology roadmap.Application of nanotechnology in the paper industry. The perspective of the nanoscience center, Market analysis and industrial needs,75p. Kamel,S., 2007.Nanotechnology and its application in lignocellulosic composites, a mini review, Express polymer letter 1(9): 546-575. Rosa,M.L.S.,Rehman,N.,Miranda,M.,Nachtigal,S.,Bica,C., 2011.Chlorine-free Extraction of Cellulose from Rice Husk and Whisker Isolation,Carbohydrate Polymers10(1016/j):1-29. Luduena,L.,Fasce,D.,Alvarez,A.,Stefani,I.P., 2011. Nanocellulose from rice husk following alkaline treatment to remove silica, Bioresources 6(2):1440-1453. Chen.W., Yu,H., Liu,Y., Hai,Y., Zjang,M., Chen,P., 2011.Isolation and characterization of cellulose nanofibers from four plant cellulose fibers using a chemical-ultrasonic process,Cellulose 18:433-442. Janardhnan,S., Sain,M., 2011. Targeted disruption of hydroxyl chemistry and crystallinity in natural fiber for isolation of cellulose nanofiber via enzymatic treatment, Bioresources 6(2):1242-1250. Oji.J., Talaaghat.M, 2002. Extraction of oil from Iranian rice husk and rice bran. Journal of engineering university. 36,No. 4, 549-554. Chabra.D, Kashani nezhad.M, Rafiee.SH, 2006. Investigated of rice produces ways and compared that’s loss. Proceeding in 16th congress of food industries in Iran. Gorgan University, 2-12. Abraham,E., Deepa,B., Pothan, L.A., Jacob, M., Thomas, S., Cvelbar, U., Anandjiwala, R,2011. Extraction of nanocellulose fibrils from lignocellulosic fibres: A novel approach. Carbohydrate Polymers, 86:1468– 1475. Habibi, M.R., Hoseinkhani, H,. Mahdavi, S,. 2007. 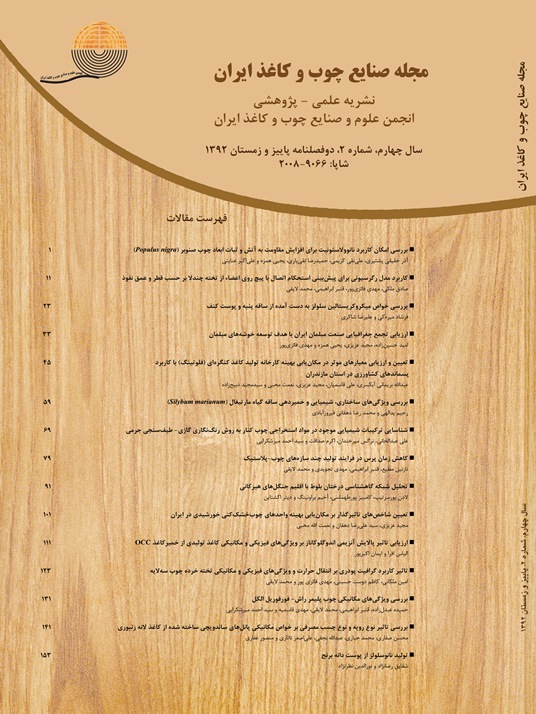 Effect of press time and resin content on the properties of heavy fiberboard made ​​from rice straw, The Journal of Iranian Wood and Paper Science, 22(1). 51-61. Fahma,F.,Iwamoto,SH.,Hori,N.,Iwata,T.,Takemura,A.,2010.Isolation,preparation,and characterization of nanofibers from oil palm empty-fruit-bunch, Cellulose 17(5): 977-985. Li,R., Fei,J., Cai,Y., Li,Y., Feng,j.,Yao,J., 2009. Cellulose whiskers extracted from mulberry-A novel biomass production, Carbohydrate Polymers 76:94-99. Segal, L., Creely, J., Martin, J. A. & Conrad, M., 1959. An empirical method for estimating the degree of crystallinity of native cellulose using the X-ray diffractometer. Text. Res. J. 29, 786–794. kumar.s. Upadahyaya.J.S. Negi.Y.S., 2010. Preparation of nano particles from corn cobs by chemical treatment methods. Bioresources 5(2):1292-1300pp. Moran,J.I.,Alvarez,A.V.,Cyras,P.V.,Vazquez,A.,2008.Extraction of cellulose and preparation of nanocellulose from sisal fiber, Cellulose 15:149-159. Rahimi, M., Behruz, R. 2009.Produce of Nanocrystalline cellulose from Wheat straw, M.Sc thesis, The university of Natural Resources and Marine Sciences of Tarbiat Modarres. 70 p.
 Yegane, F., Behruz.R., Bahramifar, N. 2010. Compared to produce nano-crystalline cellulose from waste of white office paper with sulfuric acid and maleic acid treatment. M.Sc thesis, The university of Natural Resources and Marine Sciences of Tarbiat Modarres. 70 p. Jonoobi,M., harun,J., Tahir,P., Zaini,L., Saifulazry,S., Davoodi,M.M., 2010. Characteristics of nanofibers extracted from kenaf core, Bioresources 5(4):2556-2566. Chen.,W., Yu,H., Liu,Y., Chen,P., Zhang,M., Hai,Y., 2010.Individualization of cellulose nanofibers from wood using high-intensity ultrasonication combined with chemical pretreatments. Carbohydrate Polymers 83(4):1804-1811. Chen,Y., Liu,C., Chang,P.R., Cao,X., Anderson,D.P., 2009. Bionanocomposites based on pea starch and cellulose nanowhiskers hydrolyzed from pea hull fiber: Effect of hydrolysis time Carbohydrate Polymers 76 (4):607–615.